We meet Frank Abagnale Jr. as a guest on a game show in the '70s. Caught, even reformed, he is on television acknowledged for what he truly is: one of the greatest con-men of the 20th century. Spielberg then briefly flashes back to his capture in France, where Hanratty finally confronts his biggest target and betrays a clear fondness for the young man beneath his taunting. By starting with these two scenes before reverting back to a mostly linear tour through Abagnale's life, Spielberg gives away his hand. The question of the cat-and-mouse game between FBI agent and confidence man is answered before anyone has even begun to ask it. This flashback betrays the director's motives: as charming and clever as so many of the reversals Abagnale routinely performs on Hanratty are, they are not the point of the expertly plotted caper. This is only made clearer when Spielberg reverts to Abagnale's youth. Leonardo DiCaprio, though using roles like this to establish a serious and adult persona, has never looked more fresh-faced than the boy Frank. Abagnale has the perfect postwar adolescence: his respected father, Frank Sr. (Christopher Walken) sends him to private school and continues to romance his wife (Nathalie Baye), whom he met while serving in France. DiCaprio wears a boyish smile that takes years off his already cherubic face, and he regards his father's induction into the local Rotary Club's lifetime membership as something approaching beatification. To see this kid, so naïve and joyous, juxtaposed so closely with the rotting but still cunning knave trying to escape from a French prison creates a cognitive difference. With considerable speed, however, Spielberg begins to bridge the two beings into the same conflicted son. Frank Sr. exhibits some erratic, even dishonest behavior with bankers, and his mutterings about the I.R.S. knocking on his door coincide with shots of the Abagnales' fortunes reversing. To keep the feds at bay, the family must sell their home and move into a smaller place, as well as getting rid of the car. The parents must also send their son to public school, where he goes the first day in his old uniform, tacitly attempting to keep some form of familiarity in the upheaval (his behavior here mirrors that of Max Fischer in Rushmore after his expulsion from the titular academy). But it is this act that helps bring out the start of Abagnale's gift for tricking people. Shoved by a bully, he walks into class with that kid and, when some mistake him for the substitute teacher, he plays along so that he might get his revenge. As the start of an epic criminal career, it's so innocuous as to be no less bewildering than the sinless child previously seen. But the childish quality of Abagnale's trick reveals a crucial aspect of his crimes that are hammered home by his subsequent discovery of his mother's infidelity and his parents' divorce. Faced with having to choose between his separating parents, Abagnale somehow seems to grow even younger and more innocent as cross-cut frames of a sympathetic but impatient lawyer urging the boy to sign meet shots of the young man desperately fleeing the situation, running so hard that the formal elegance of the film to that point is instantly upturned in favor of handheld, momentum-filled shots that carry all the frantic energy of Spielberg's handheld footage in Saving Private Ryan. Abagnale's subsequent career of confidence tricks, of check fraud slowly blossoming into full-on impersonations of pilots, doctors and attorneys, comes back to this single moment, a despairing child fleeing reality for the safety of his own illusions. 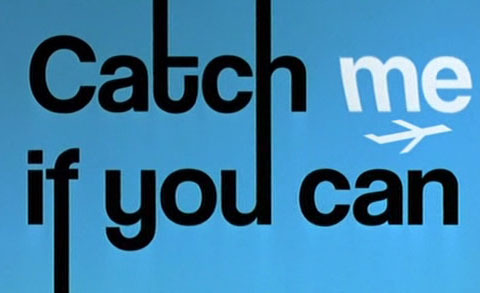 In that sense, the Spielberg film with which Catch Me if You Can shares the most is Hook. They even share something of a common shot: the honoring of the beloved and respected parental figure in a ceremony that is both modest and overwhelming for what it means to the principal characters in attendance. There's more humor in Frank Sr.'s speech about the two mice than the resonant beauty of orphans standing for Granny Wendy, but that early shot acts a clue to this film's fairy tale origins. But Catch Me if You Can succeeds where Hook so often falls flat as a story of reality and fantasy colliding. Spielberg's Pan is a realist being sucked back into his fantasy world against his will, creating an awkward struggle in which regression is bizarrely proffered as a positive goal. Abagnale's story progresses the proper way, in which a fantasist resists the constant tug of the world around him as he must continuously up the ante of his imagination to outpace the truth. To further emphasize this, Spielberg took the biggest creative license with Abagnale's life to stage two invented reunions between father and son. These scenes beautifully capture the son's futile attempts to remold everything back into the life he remembers. Having amassed a pile of money through check fraud gotten over by the respect given to him as a Pan-Am "pilot," Abagnale treats Frank Sr. to lavish lunches and extravagant gifts that the father, still hounded by the I.R.S., must turn down. But the son persists, and he speaks to his dad about going to pick up mom as if nothing happened, as if she didn't already remarry and Frank Sr. wasn't hollowed out from the blows of his career and family imploding at the same time. Abagnale is so caught up in his lies, and still so childish, that he cannot see the problem of giving his audited father mountains of cash he himself obtained illegally. With his father, he really is a pilot, just trying to give back to his parents who are going through a rough spot but will come through it all right. 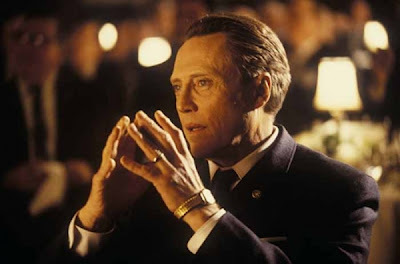 Walken shines in these scenes. Every time he returns to the screen, Frank Sr. is more bitter, more heartbroken, but his self-pity never stops him from seeing right through his boy. In their first reunion, Walken has a smirk on his face that betrays all he knows from the moment he sets eyes on Junior. Walken puts an edge into his last few lines with DiCaprio, and when Frank Sr. parts with a cryptically whispered, "The rest of us really are suckers," the depth of his son's cluelessness is made plain by his confusion. His dad just shattered the illusion and Abagnale doesn't even know it. But when the two later meet, after Frank Sr. is reduced to working for the government he so virulently hates, the father's knowledge of his son's true activities comes out in the open when the man actually encourages his kid to continue his antics, so thrilled that his boy is giving the government a hard time. Ironically, it is Abagnale's true identity as a criminal that makes his father the happiest, but Abagnale still cannot break out of his fantasy. Frank Sr. is by this point completely broken, and all he has left in life is the brief thrill of vicarious revenge. But his son cannot see that, for he cannot even see himself. But reality breaks through Abagnale's barriers despite his best efforts, and Spielberg further clarifies his placement of the opening flashbacks by presenting an alternate bond between Abagnale and Hanratty. The latter works in the bank fraud division he helped create, and he attaches himself to Abagnale's extensive paper trail with solemn zeal. Hanks plays Hanratty almost totally without mirth, albeit with a touch of self-awareness. (I'd give anything to have been in an audience when he replies to his partners' complaints of his humorlessness with a vulgar knock-knock joke that could bring the house down.) Hanratty gets so caught up in Abagnale's case that he himself risks folly by disappearing solely into his work. He's chasing the man beneath all those aliases, and when the two meet for the first time, Abagnale manages to fool Hanratty into letting him go. Later, the boy recounts to the agent what his dad told him about why the Yankees win, that everyone else is "looking at the pinstripes." For a time, Hanratty is as much a part of the fantasy world Frank Jr. constructs as the various occupations. Yet Hanratty offers clarity to Abagnale, clarity both unwanted and desired. He represents hard truth in the form of the law, unable to nab the con man but nevertheless capable of ruffling his feathers. At one point in the film, Abagnale has fallen so far into his own construct that he attempts to marry a girl (Amy Adams) who thinks him one of his aliases. This essentially traps him, but he doesn't realize it until Hanratty's team tracks him down, demolishing Abagnale's house of cards and gradually setting the boy on a path to collapse. Incidentally, it's a collapse that, in a mirror of Peter Pan in the flashback of Hook, occurs when he sees his mom happy with another child. But where the young Pan fully divorced from reality to retreat to Neverland, Abagnale must finally come to terms with that reality. On the flip side, Hanratty also stands for the normalcy Abagnale genuinely wants from all his high-flying escapades. Like Abagnale's father, Hanratty is divorced, only it was dedication to his job, not an illegal undermining of it, that splintered his family. Hanratty is also the one to see the real Abagnale, again in a foil of the boy's father: Frank Sr. sees vengeance for his torment at the hands of feds, while Carl sees the child just wanting to be loved. When Hanratty receives the first of his Christmas calls from Abagnale, he rightly deduces that the boy is calling because he has no one else to talk to, but his victorious laughing soon gives way to a clear empathy for the kid. Abagnale's genuine regret for the hassle he causes Hanratty feels like that of a disobedient but faithful child apologizing for letting down his father. All the bravado in DiCaprio's voice dies in those phone calls, his guarded but somber tone suggests that he's growing tired of all the games too. As with last year's War Horse, Catch Me if You Can represents a deliciously old-school Spielberg in the midst of his literally bleached-out late career. 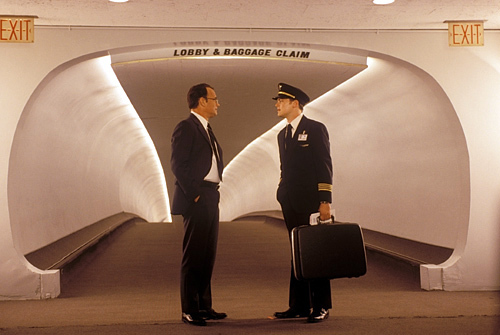 Janusz Kaminski's cinematography is rich in color, with classically arranged shots offering sumptuous detail as Spielberg moves swiftly through Abagnale's fast-paced life, a speed that apparently matched that of production. Though it lacks the gravitas of so many of Spielberg's late work, the film nevertheless features perhaps the best of his exuberant energy, which might explain how he could average three shooting locations a production day and still wind up with such an immaculately framed picture. To return to The Sugarland Express, Spielberg's light but poignant 2002 feature forms something of a bookend with his first theatrical release. They are both fleet-footed exercises in style that reveal their maker's deep preoccupations, but where The Sugarland Express ends with confusion and sadness, Catch Me if You Can shows its characters moving on, coping with their failures and even finding contentment. Though filmed and released after Minority Report, Catch Me if You Can feels as if it should come before it, forming a tighter bond with A.I. 's mature, insightful thoughts on childhood and humanity and leaving Spielberg's morally probing tech thriller to the post-9/11 films to follow. But regardless of its release date, Catch Me if You Can may be the final word on Spielberg's obsession with innocence, childhood and family. That's not to say he hasn't broached the subject since, but certainly nothing he's done since has even neared the intensity and depth with which it has reckoned with the director's most personal themes. It's a film that I liked when I first saw but various repeated viewings on HBO has made me appreciate the film even more. It's my parents' favorite Spielberg film. I like the humor as well as the scenes between diCaprio and Walken. Notably Walken who is heartbreaking to watch and give a performance that isn't the crazy, fun Walken we all know and love. One of the few Spielberg films that I genuinely love.